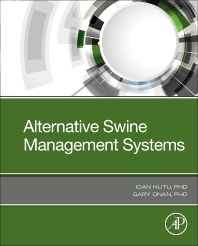 Alternative Swine Management Systems examines technologically humane substitutions for swine production, focusing specifically on hoop structure systems. Benefits of these alternatives include enhanced animal welfare and reduced capital cost. From small holders involved in low input pig farms, to larger commercial operations, this book instructs users on new technology to improve the quality of animal production, animal welfare and environmental protection points. Dr. Hutu received his Ph.D. in Animal Reproduction from Banat’s University of Agricultural Science and Veterinary Medicine in Timisoara. He is currently a faculty member in the Department of Animal Production and Veterinary Public Health, where he teaches courses such as Farming Equipment and Animal Science & Production. Dr. Onan received his Bachelor of Science (1971) and Master of Science (1981) in Animal Science, and then his Ph.D. (1985) in Meat Science and Muscle Biology from the University of Wisconsin-Madison. He is currently a faculty member in the Department of Animal and Food Science at the University of Wisconsin-River Falls, USA, where he teaches courses such as Introduction to Animal Science, Animal Physiology, Meat Animal Evaluation, Swine Production, and Sheep Production.